Just as I was about to throw down the towel and declare a beauty rut, a package arrives on my doorstep to remind me that not every company is bound by "colors of the season." Many of the varied counters in department stores are owned by the same parent company, and the products of the season tend to have the same vibe, so trips to the beauty floor quickly become stale. 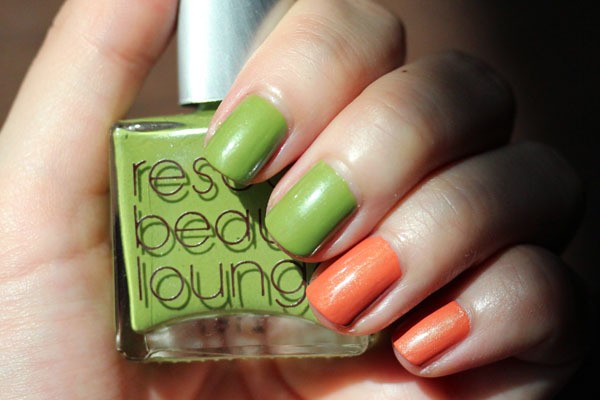 Ji from Rescue Beauty Lounge works on her own, (dare I say) unpolluted by outside influences. She picks an inspiration and charges on with it, and I absolutely love her for doing so. 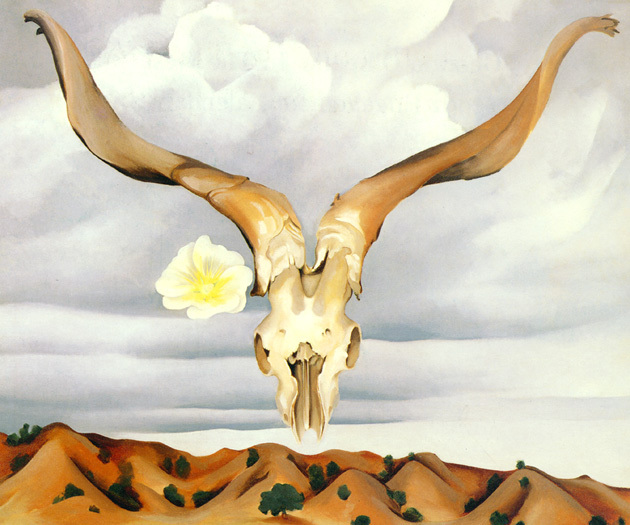 Her most recent collection is inspired by the artist Georgia O'Keeffe (Ji describes the entire creation process in this blog post). There are seven luxurious shades to choose from in the collection, and I purchased all of them (I've gotten into the habit of acquiring full RBL collections during pre-orders). For today, however, I'll show you my two favorites: Abiquiu and Santa Fe Road. 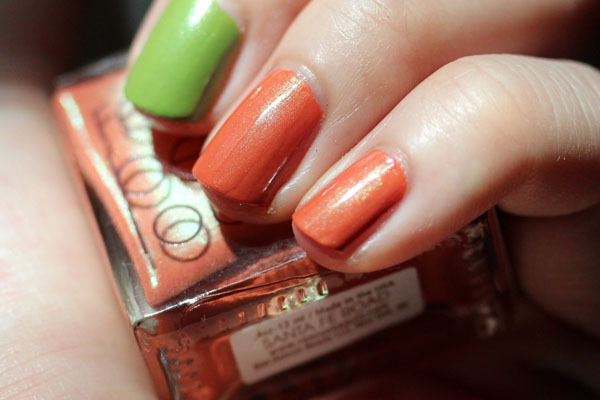 Abiquiu is lime green with silver microshimmer, while Santa Fe Road is an apricot orange that sports a denser microshimmer. 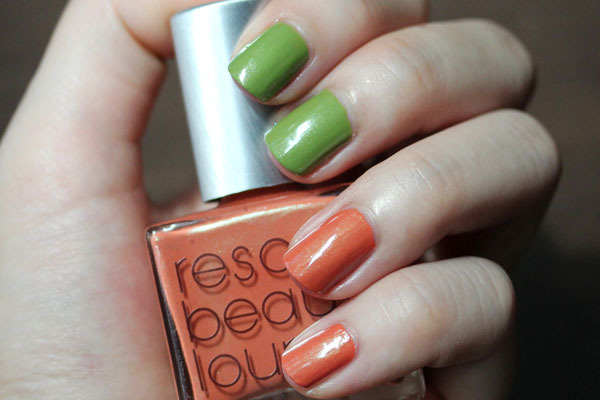 Both polishes apply flawlessly and could very easily be one-coaters. They are $20 each. Ji just finished shipping out pre-orders and will release the collection to the public soon. 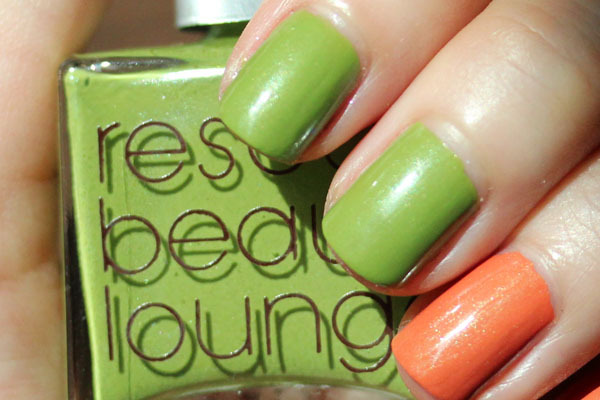 The best way to get latest updates on Rescue Beauty Lounge is to follow the brand on their Facebook or Twitter. I love these two!! I am currently wearing Oriental Poppy, and I don't want to take it off! I'm thinking Ghost Ranch next but they are all so pretty I can't make up my mind! *gasps* I think I need both!!! Can't wait to see the rest of them! oh my gosh, they are both so unique and so so lovely! WHY haven't I tried anything from this brand?!? Major fail. They look SO PRETTY lined up together like that. I only have one RBL polish and it applies like a dream. Getting a manicure by Ji was on my list to do in NYC but that's over now, shucks.